I only recommend things I like. This is one of those things. I bought these sandals back in May. They were on sale and proceeds go towards animal welfare and rescue. After I fell and my feet and legs, especially the right foot and leg, swelled, I wasn't sure I was going to be able to wear them. I took them to Virginia. 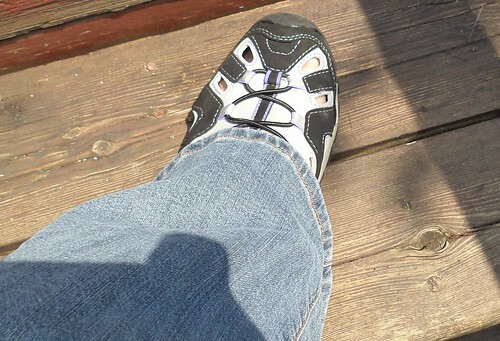 On the day we went up into the mountains, I tried them on and they fit. The elastic on the top stretched enough to get my still swollen foot into the sandal. They were light weight enough that walking didn't feel like I was dragging around a ball and chain. My tennis shoes, back in May, felt very heavy on my battered leg. I preferred going shoeless, but that's not an option in the office. Plus, if I took off my shoes, I sometimes couldn't get the right one back on as my foot would swell during the day. Since that day, I've been wearing these to the office and on errands. The thick sole is great for my stability, as is the fact that they are almost more of a shoe than a sandal. They have great flexibility and are comfortable. Plus, I can get them on when my hands don't want to work. So, if you are looking for a sandal that is almost like a shoe, these are fantastic and come heartily recommended.